EIA was first mentioned in Zanzibar's legal documents in 1992, as part of the National Environmental Policy. More detailed provisions followed in the Environmental Management for Sustainable Development Act No.2 (1996). The same Act stipulated that detailed procedural regulations were to be issued within six months after the law came into force. In reality, however, this process took six years: in 2002 the Environment Impact Assessment (Procedures) Regulations came into force. enhancement of monitoring programmes and assessment for the state of the environment. The main difference between this environmental policy and the 1992 policy is that not only EIA, but also SEA is mentioned. The EIA procedure in Zanzibar is visualized above. DoE takes a screening decision based on an Initial Environmental Report (IER) prepared by the proponent, and requests further information if necessary. The proponent is responsible for scoping, preparing Terms of Reference for the EIA, and preparing the Environmental Impact Statement (EIS, or EIA report) while facilitating public participation in the process. DoE reviews the EIS - and arranges public participation in the review process - and takes a decision on permitting (requesting more information if necessary), including approval or disapproval of the EIS. In case of disapproval, the proponent has the right to appeal. In case of approval, an EIS certificate is granted and the proponent can start implementing the project. DoE is responsible for monitoring and auditing during implementation, until decommissioning by the proponent. Screening is required. DoE is the screening authority. The Environmental Management Act includes a list of activities for which EIA is not required unless DoE decides otherwise (Schedule 1), including for example domestic activities, small-scale businesses, small-scale rainfed agriculture, air charter services, and basic infrastructure maintenance. The Act also includes a list of activities for which EIA is in all cases obligatory (Schedule 2), including activities such as the development of major residential areas, operation of a power generation plant, oil refinery, water supply or waste disposal system, development of a port, development of a large hotel, etcetera. Such activities may directly proceed to the scoping stage of the EIA procedure. require an Environmental Impact Statement (i.e. an EIA report that results from an EIA procedure), as stated in a letter titled Results of Screening. have other specific characteristics as described in the Act. The 'Schedule 2' list, which indicates activities that require EIA, includes activities aiming at the development of 'environmentally sensitive areas, including forests, mangroves, small islets and water catchments'. It also includes activities aiming at the gazetting of existing protected areas. any other matters as may be prescribed. As part of the SMOLE programme, Environmental Screening Process Forms have been drafted to support the screening process. Their use is not mandatory. The document Procedures for Conducting Environmental Impact Assessment (EIA) and Environmental Audit in Zanzibar indicates timeframes for various stages of the EIA procedure. Its legal status is however unclear. 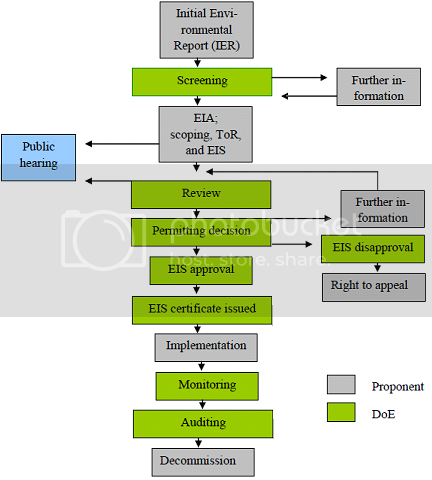 According to these Procedures, DoE should undertake a screening based on the starting document within ten days after the proponent's notification to DoE of the plan to undertake EIA. A screening statement should be produced within another ten days after screening. indication of relationship between timing of environmental analyses and the proponent's tentative planning. Legal documents do not discuss publication, review, approval and public participation of the scoping document. DoE is responsible for scoping, but should invite the proponent to participate. Consultants can be asked to assist, at the expense of the proponent. methodologies to be used for data collection and analysis. The Act indicates that the institution responsible for the environment (DoE) shall determine the scope of the EIA report in agreement with the proponent of the activity. The Procedures for Conducting Environmental Impact Assessment (EIA) and Environmental Audit in Zanzibar indicate that DoE should undertake scoping and produce a scoping report between ten and twenty (working) days after the screening statement. A Terms of Reference for the EIA report should be produced by DoE in the same timeframe. After approval of the team of experts, the proponent should submit an Environmental Impact Statement (or EIA report) to DoE within two to six months. In any case, the EIA report shall be prepared 'early enough so that it can serve practically as an important contribution to the decision making process and will not be used to rationalize or justify decisions already made'. An EIA report should include the following elements. any other relevant information as may be prescribed. it should serve as an assessment of environmental impacts leading to approval or disapproval of the project. An EIS shall be undertaken by experts whose names and qualifications are approved by the institution responsible for the environment. The institution responsible for the environment (DoE) is responsible for reviewing the submitted EIA report. comments received on the EIA report. After the review process, the EIA report is graded by means of a percentage that indicates its quality. The Criteria for Evaluating Adequacy of EIA Reports provide guidelines for ascribing these scores. A percentage between 80 and 100, for example, indicates that the report is 'excellent', with 'no task left incomplete', while a percentage between 60 and 70 indicates 'satisfactory despite omissions and inadequacies'. If overall performance is below 60%, revision of the EIA report is required. If DoE deems it necessary for its review, it may request for additional information from the proponent (in the form of documents, plans, site visits, etc.). The proponent is obliged to deliver the requested information in the specified timeframe, and risks disapproval of its application for an EIA certificate if it refuses to do so. DoE is responsible for review of the EIA report. Use of external expertise is not mentioned in any of the legal documents. Twenty days for submission of this additional information by the proponent after DoE's request. disapproval of the activity and refusal of an EIA certificate, including recommendation to the licensing institution that the activity shall not be allowed to proceed. there are no alternatives which can mitigate or remedy these impacts. No licensing institution shall issue a licence, permit, certificate, or other form of approval for an activity which is likely to have a significant impact on the environment unless an EIA certificate has been issued for the activity. The legal documents do not contain requirements for justification of the decision based on the EIA. According to the Procedures for Conducting Environmental Impact Assessment (EIA) and Environmental Audit in Zanzibar, DoE should take its decision for approval or disapproval of the activity within fourteen (working) days after receiving the final EIA report. The Environmental Management Act requires that the EIA certificate imposes conditions to ensure that implementation of the activity complies with the Act. DoE is obliged to carry out periodic audits of each activity to monitor fulfilments of these conditions and can make use of external expertise to fulfil this monitoring obligation. The proponent of the activity is required to submit any records or reports requested by DoE for purposes of compliance monitoring. pay a fine imposed by DoE for non-compliance. If additional monitoring (after a reasonable period of time following the initial monitoring) reveals continued non-compliance, DoE shall impose an additional fine, revoke the EIA certificate, and report this to the relevant licensing institution. An additional measure to prevent non-compliance is the use of environmental performance bonds, as described in the EIA (Procedures) Regulations 2002 and in the Environmental Management Act. Any party undertaking an activity under an EIA certificate is obliged to deposit a 'performance bond' equal to 10% of the total project investment in the account of (at that time) the Ministry of Agriculture, Natural Resources, Environment and Cooperatives. This serves as a guarantee that the proponent will carry out the project with due regard to the environment, since it is only refunded to the depositor when compliance with environmental conditions is shown. DoE can decide to confiscate the total or a part of the performance bond when it finds that the proponent's activities violate the provisions of the Environmental Management Act or the conditions of a certificate/license/permit issued under the Act. In appropriate circumstances the [Environmental Impact] statements may follow preliminary hearings designed to gather information for use in the statements. Public participation via public hearings before preparation of the draft EIA report is therefore recommended, but not mandatory. solicit the written comments of the people who will be affected by the project. Only written comments can be used by the public to express their opinions on the EIA report. These are to be solicited by DoE. Public comments should be taken into account as review criteria for the EIA report - hence they are used in approval of the report. Otherwise there are no requirements for justification of approval of the EIA report or the project itself based on public comments. The legal documents do not mention any costs for the public associated with participation in the EIA procedure. The Environmental Management Act indicates that public comments on the EIA report can be submitted during a period which should be between twenty and thirty days, starting on the moment that all relevant persons have been notified. Only the EIA report needs to be made available to the public. The EIA report needs to be shared with the public 'by any appropriate means'. According to the Procedures for Conducting EIA and Environmental Audit in Zanzibar, DoE should do this within ten days after submission of the report. The EIA Guidelines and Procedures (draft version, 2009) however mention a timeframe of five days. considers the conditions included in the EIA certificate awarded by DoE unfeasible to such an extent that they are equivalent to disapproval of the activity. The Minister states reasons for approving or disapproving the activity and shows that the recommendation and information provided by DoE has been used in this decision. If the appealing party is dissatisfied with the Minister's decision, further appeal to the Committee of the Revolutionary Council on Environment is possible. This Committee is the highest decision-making body on environmental matters in Zanzibar, and its decision is final. Environmental Management for Sustainable Development Act No.2 (1996). Procedures for Conducting Environmental Impact Assessment (EIA) and Environmental Audit in Zanzibar - detailed procedures by DoE, date and legal status unknown. DoE's publication Environmental Impact Assessment - Guidelines and procedures with several Annexes (draft version, 2009) contains very detailed guidelines on screening (methods, report contents), scoping (methods, report contents, ToR requirements), reporting (style and format), review (team, type of information, criteria), monitoring (methods, parameters, results presentation), and other relevant topics. Sector-specific guidelines for four sectors (agriculture, hotel development, aquaculture, and urban development) are available in the Annexes of the EIA Guidelines and Procedures (draft version, 2009). No person shall undertake any activity which is likely to have a significant impact on the environment without an EIA certificate issued under this Act. No licensing institution shall issue a licence, permit, certificate, or other form of approval for an activity which is likely to have a significant impact on the environment unless an EIA certificate has been issued for the activity. This considers any development activity, undertaken by any person or institution - including governmental parties. The central EIA authority in Zanzibar is the Department of Environment (DoE). Its responsibility is to manage and regulate EIA requirements and procedures in accordance with the provisions of the Environmental Management Act. The landscape of EIA actors in Zanzibar however changes frequently, as do the (names of) relevant government departments. EIA mandates are centralized: all decisions are taken by DoE. The proponent needs to pay for the costs of preparing an EIA report, as well as for the EIA review, including any costs involved when DoE hires external consultants for this review. This is stated in the Environmental Management Act and the EIA (Procedures) Regulations 2002. The document A Study Report on EIA Needs Assessment for the Department of Environment, Zanzibar (2006) indicates that EIA is only slowly gaining momentum in Zanzibar. It found that between 1989 (DoE's establishment) and 2006 about 27 EIAs have been conducted in Zanzibar and that for less than half of all large hotels (with EIA obligation) EIA was undertaken. 1996-2009: in total 35 EIAs undertaken (all for hotels - and many more large hotels have been built in this time period). Environmental Screening Process Forms - designed as part of the SMOLE programme.